Rusty Garden Arches,Rusty Arch, Rusted Arches,Rusty Obelisk. 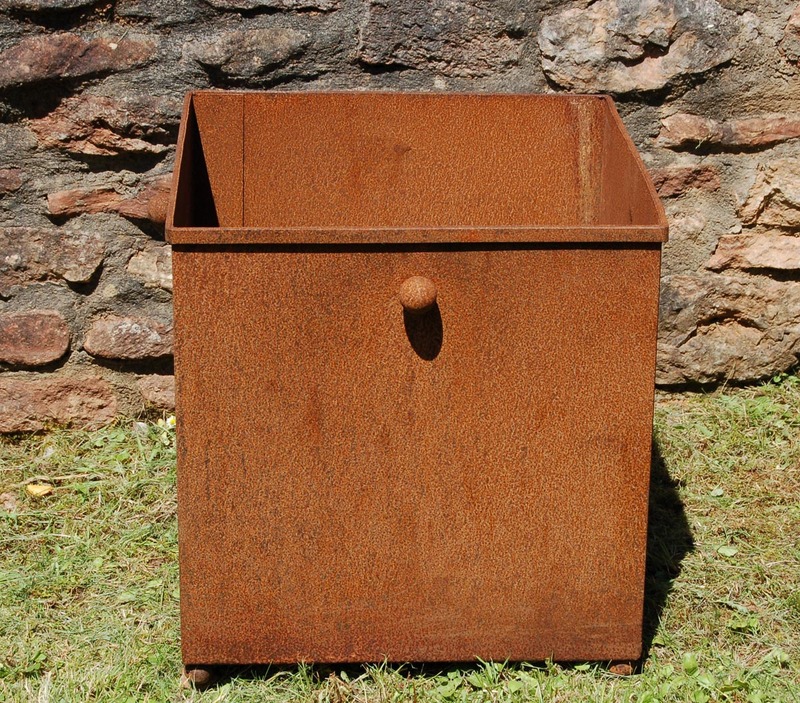 Most of our products are available in a Natural Rusty Finish at reasonable prices. Here are some examples. 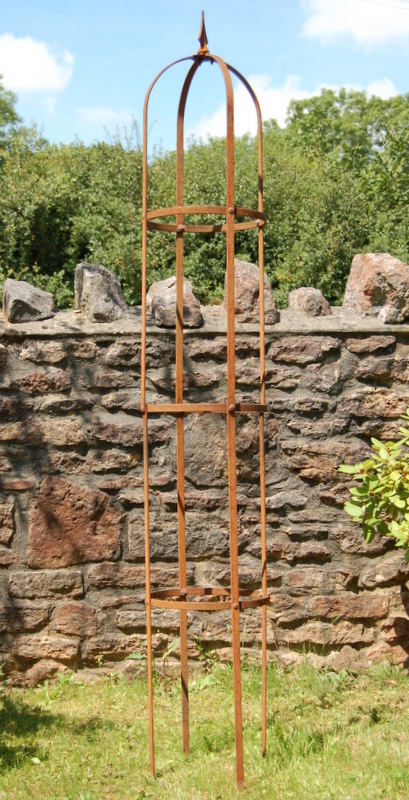 Square Obelisk Large Size (83"/211cm high) Rusty finish. £111.25 Click Here for details of other sizes. £ 122.55 each also available in 2 smaller sizes - click Here for details. Click image for larger picture. 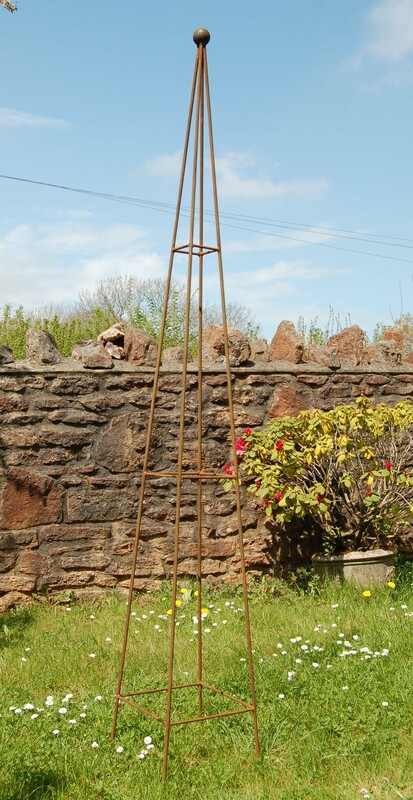 Round Top Garden Obelisk Medium with 3 Rings. 83"/221cm high,14"/35cm diameter. Click Here for more details. Natural Rusted Finish. Click image for larger picture. Classical Pointed Obelisk Large 86"/218cm high. Also Small 61"/155cm high and Medium 71"/180cm high. Prices are £67.45, £97.25 and £122.55. 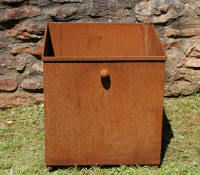 Natural Rusty Finish.Click Here for Obelisk page. Click image for larger picture. 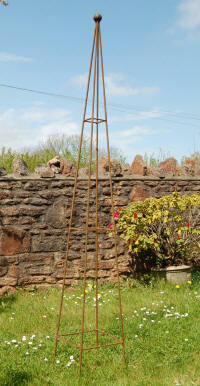 Classical Square Obelisks Medium 71"/180cm High £88.35 incl VAT. 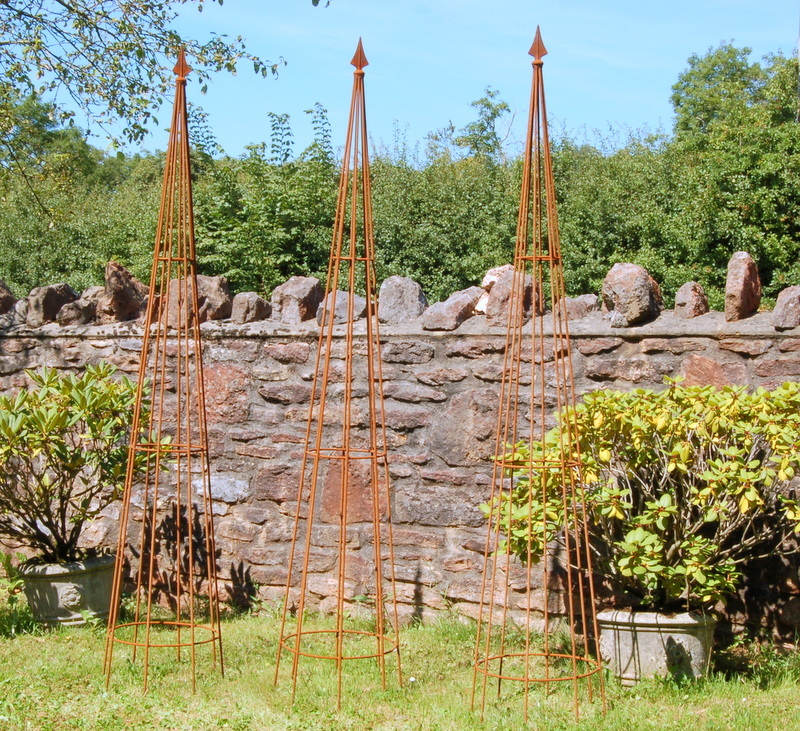 Natural Rusty Obelisks. Click image for larger picture. We can now offer the Camelot Gazebo in a range of sizes from 5 ft diameter to 10 ft diameter, as illustrated above. The Gazebos of 7 ft and over in diameter have 6 legs, uniformly spaced in a circle. Those of 9 ft and over diameter have 8 legs similarly arranged. The overall height is 8 ft 4" or 255cms. 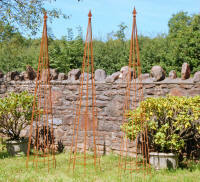 All our Gazebos are made from solid iron rod and so will last many years. There is an option to supply each size of Gazebo without one of the legs to provide an opening, which would normally be occupied by this leg. We offer these as Arbours at a slightly lower price. 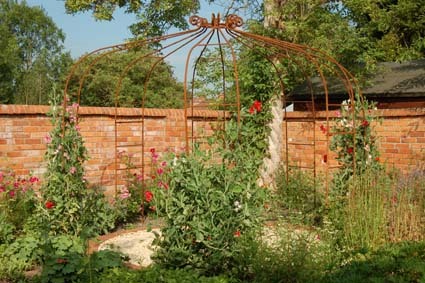 The price of the10ft/305cm Diameter Natural Rusty version illustrated above is £ 1095.Click Here for the Gazebo Page. 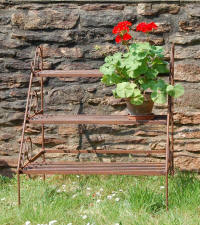 Medium Size- 56"or 144cm high at £ 3.95. 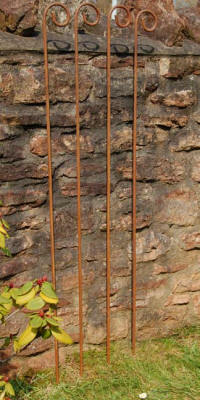 Also Small 39"/100cm at £2.95 and Large 78"/200cm at £4.95.Click Here for Garden Stake Page. Click image for larger picture. £135 plus £15 Delivery Charge. Other sizes available. 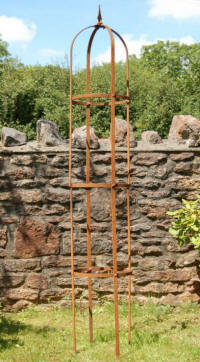 36"/91cm h x 28"/71cm w x 27"/69cm d Natural Rusty £119.50. 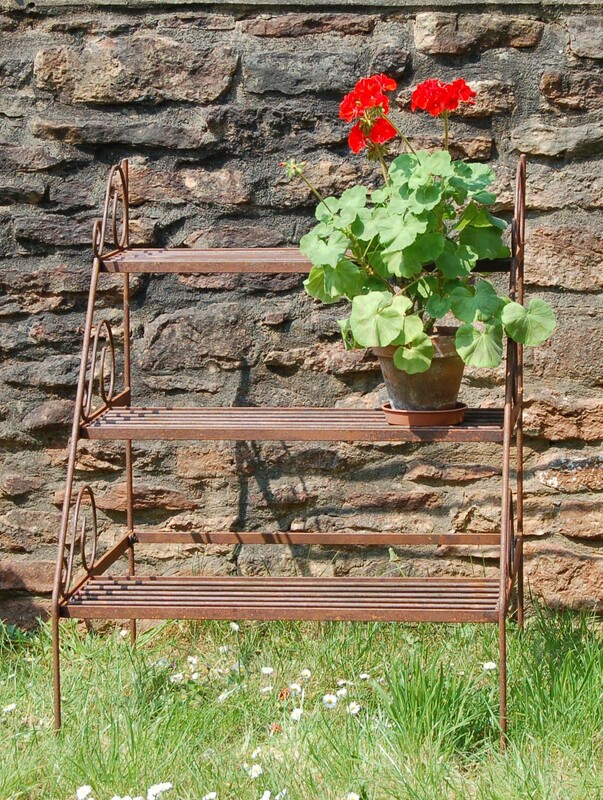 Click Here for more Plant Stand details. Click image for larger picture. Over £500 (including VAT) the delivery charge is £37. There is an extra delivery charge for parts of Scotland, parts of Wales, the Isle of Wight and Northern Ireland. If you are contacting us from outside the UK please email us with your details so that we can quote you for delivery to your home.